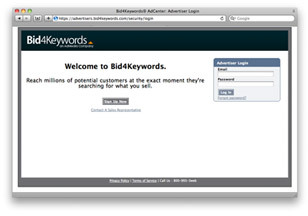 Bid4Keywords utilizes a Precision Pricing Portal to simplify the account management process. Advertisers receive access to our proprietary click tracking system, which allows for accurate campaign performance analysis. Quick reports present brief overviews for straightforward data, though custom reports provide in-depth information tailor fit to meet the client's needs. Reports detail clicks, impressions, and conversions. Additionally, the admin area gives clients the ability to alter bids manually based on impression and/or conversion metrics. This flexibility facilities optimization progression, which first time advertisers find especially useful. 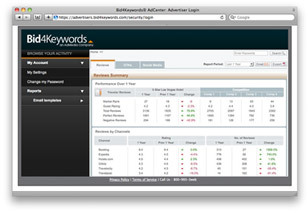 Smart Match connects your ads to exact keyword queries as well as slight variations, such as plural forms of a word. Broad match opens up the traffic pool to include a wider audience while Negative Matching prevents useless clicks. AdMedia matches any new client's $100 deposit.